Cal “Spectre” Martin is out of the military, but that doesn’t mean he’s out from behind enemy lines. In a techno thriller that launches the military/political espionage SPECTRE series, C.W. Lemoine explores just how far a fighter pilot will go to save the ones he loves. After a combat incident in Iraq, Cal “Spectre” Martin was grounded and told he would never fly an F-16 again. Years later, he has started a new civilian life with his F-16 pilot fiancée, still haunted by the nightmares of his last deployment. 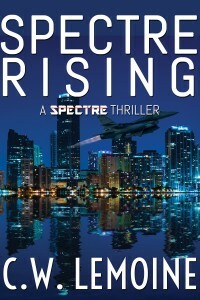 But when she goes missing on a routine training mission off the South Florida coast, Spectre unwillingly finds himself thrust back onto the frontlines of the war on terror – this time, not in the skies over Iraq, but on the streets of Miami.